Longer and revamped, the 2008 Chevrolet Malibu LS comes in as the base trim for this midsize sedan. Equipped with a 2.4-liter DOHC Ecotec inline four engine and 4-speed automatic, the powertrain delivers 169 hp and 160 ft-lbs of torque at 4,500 RPM. Fuel economy averages 22/30 mpg, thanks to variable valve timing. Also available is a 3.6-liter, 252-hp DOHC V6 with a 6-speed automatic. The front-wheel-drive sedan rides on a Macpherson strut front and multilink rear suspension. It seats four comfortably, with split-folding rear seats that open onto a 15-cubic-foot trunk. Tested only for frontal impact and rollovers, the 2008 Malibu LS earns four and five stars. It now comes standard with both dual front-side and side curtain airbags for both rows, traction control, and 4-wheel disc and ABS brakes with electronic brakeforce distribution. The 16-inch wheels with all-season tires come with a tire monitor. OnStar with navigation, automatic headlights, halogen lamps, and foglights are also standard. Larger 17- and 18-inch wheels are available. Well-equipped for a base model, the 2008 Malibu LS offers full power features (windows, locks, and mirrors), including remote entry and wheel-mounted cruise control. On the dash you'll find a trip computer, tachometer, two 12-volt power outlets, and a temperature display. Intermittent wipers, tilt and telescopic steering, and hands-free phone controls are also included. The CD player is MP3-compatible, and the LS offers six months of free satellite radio. Options add a power driver's seat, power-adjustable pedals, remote start, and a CD changer. 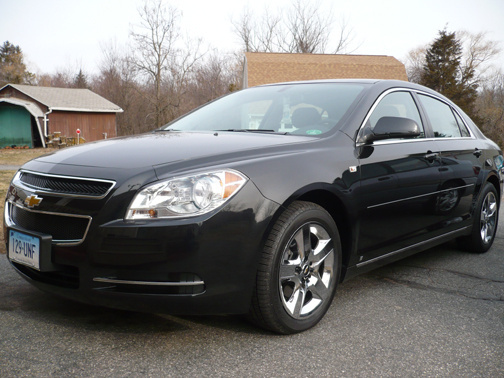 Additional safety and convenience features come with the 2008 Chevrolet Malibu LT1 trim. This front-wheel-drive midsize sedan adds stability control to the already standard traction control, 4-wheel disc and ABS brakes, and dual front-side and side curtain airbags for both rows. It also gets larger 17-inch chrome wheels with all-season tires. In the cabin, the driver gets a 2-way power seat and the front passenger seat now folds flat for additional cargo space beyond the 15-cubic-foot trunk. Audio controls for the CD/MP3 (with radio data) player join the cruise controls in the 2008 Malibu LT1. The sedan is powered by a 160-hp, 2.4-liter DOCH Ecotec inline four engine and 4-speed automatic, but a more-powerful 252-hp, 3.6-liter DOHC V6 with 6-speed automatic is available. In addition to the above features, other safety equipment includes OnStar with navigation, a tire monitor, halogen lamps, automatic headlights, and foglights. 18-inch alloy wheels can be added. The sedan seats four with 42 inches of legroom up front and 37 in the back. It offers four cupholders and two front power outlets. A back seat power outlet is optional. Power windows, locks, and mirrors; remote entry; satellite radio; tilt and telescopic steering; and a trip computer make up some of the standard features. You also get intermittent wipers, a temperature display, tachometer, and hands-free phone controls. Moving up to the LT1 gets you a few more options, including a sunroof. This joins a 6-way power driver's seat, TAPshift on the steering wheel, power-adjustable pedals, a 6-CD changer, remote start, and a cargo net. Suede upholstery, heated front seats, leather steering-wheel trim, and a 6-way power driver's seat represent the main upgrades when you move up to the 2008 Chevrolet Malibu LT2 trim. The midsize sedan seats four in two rows, with a 60/40 split-folding rear seat and fold-flat front passenger seat. Legroom averages 42 inches up front and 37 in the back. The trunk holds 15.1 cubic feet and comes with a standard cargo net. Powering this front-wheel-drive sedan is a 169-hp, 2.4-liter, DOHC Ecotec inline four engine that gets 160 ft-lbs of torque at 4,000 RPM. It's paired with a 4-speed automatic. Adding the optional 3.6-liter, 256-hp V6 and 6-speed TAPshift automatic gives you 251 ft-lbs of torque at 3,200 RPM, and comes in a package with dual chrome exhaust tips. In addition to the extra standard features, the 2008 Malibu LT2 offers power windows, locks, and mirrors, remote entry, a trip computer, and wheel-mounted cruise and audio controls for the CD/MP3 player. The sound system features an MP3 input jack, radio data, and satellite radio. Hands-free phone controls, tilt and telescopic steering, intermittent wipers, a temperature display, and adjustable pedals are also standard. A sunroof and 6-CD changer are available options. Four- and five-star frontal impact test ratings are a result of standard traction and stability control, dual front-side airbags with passenger deactivation, side curtain bags for both rows, and 4-wheel disc and ABS brakes with electronic brakeforce distribution. The 17-inch alloy wheels feature a tire monitor. In the lighting department, you get an auto-dimming rearview mirror, foglights, halogen lamps, and automatic headlights. OnStar with turn-by-turn navigation is also standard. New for 2008, the Chevrolet Malibu Hybrid combines the Ecotec 2.4-liter inline four engine and hydramatic 4-speed automatic with a 36-volt electric motor and a NiMH (nickel metal hydride) battery. The system features regenerative braking during deceleration, and the electric motor provides extra acceleration power when needed. Dubbed a "mild" hybrid, rather than the more common two-mode full hybrids you find in the Camry and larger SUVs, the electric motor complements the gas engine, but can't move the vehicle alone. The Malibu's system will shut off the gas engine while the vehicle isn't moving (such as at stop lights). This system is not as fuel efficient as a two-mode one, but does improve the Malibu's mpg to around 24/32 mpg. An information screen reports details on energy-saving. The 2008 Malibu Hybrid gives you a choice of climate control setups as well: the normal system used in the other trims, or an energy-saving one that does not tax the hybrid powertrain. Otherwise, the 2008 Malibu Hybrid resembles closely the LS trim on which it is based. Power windows, locks, and mirrors, a 2-way power driver's seat, remote entry, wheel-mounted cruise and audio controls, a CD player with MP3 input jack and new satellite radio, tilt and telescopic steering, intermittent wipers, hands-free phone function, and a trip computer are all standard. The front-wheel-drive sedan seats four, with split-folding rear seats that open onto a 15.1-cubic-foot trunk. Four cupholders and two front power outlets, a tachometer, and a temperature display provide added convenience. In the safety category, the Malibu Hybrid comes standard with traction and stability control, 4-wheel disc and ABS brakes with electronic brakeforce distribution, and dual front-side and side curtain airbags for both rows. The 16-inch alloy wheels feature a tire pressure monitor. OnStar with navigation, automatic headlights, and halogen lamps are other safety features. The sporty 2008 Chevrolet Malibu LTZ offers more power than other trims with its standard 3.6-liter DOHC V6 engine, which puts out 252 hp and 251 ft-lbs of torque at 3,200 RPM. It's paired with a 6-speed shiftable automatic that features paddle shifters (TAPshift) on the steering wheel. Fuel economy dips to 17/26 mpg with this engine, but you can downgrade to the 169-hp, 2.4-liter Ecotec inline four for improved mileage. This front-wheel-drive sedan includes 18-inch alloy wheels with all-season tires. Inside, passengers get leather upholstery, and the power driver's seat has up to 8 settings, while the passenger gets a 6-way power seat. The front passenger seat also folds flat, along with the split-folding rear seats, to create more cargo space. The trunk holds around 15 cubic feet. Other upgrades in the 2008 Malibu LTZ include remote start, a garage opener, auto-dimming side mirrors to go with the rearview one, heated mirrors, and an 8-speaker Bose sound system with 6-CD changer. These join already standard power windows, locks, and mirrors, remote entry, wheel-mounted cruise and audio controls, satellite radio, an MP3 input jack, leather trim for the wheel and shifter, and a trip computer. A compass is added to the temperature display on the dash. Intermittent wipers, tilt and telescopic steering, a tachometer, a security system, and two front power outlets are also standard. A rear power outlet is optional, along with a power sunroof. Making up the safety profile are 4-wheel disc and ABS brakes, dual front-side and side curtain airbags for both rows of the sedan, front and rear stabilizer bars, and traction and stability control. OnStar with navigation, a tire monitor, automatic halogen lamps, and foglights complete the package. The 2008 Malibu LTZ earns four and five stars in frontal impact tests and four in rollover tests. An option replaces the 18-inch wheels with 17-inch ones.